What constitutes ‘great social media’ varies wildly across sectors. 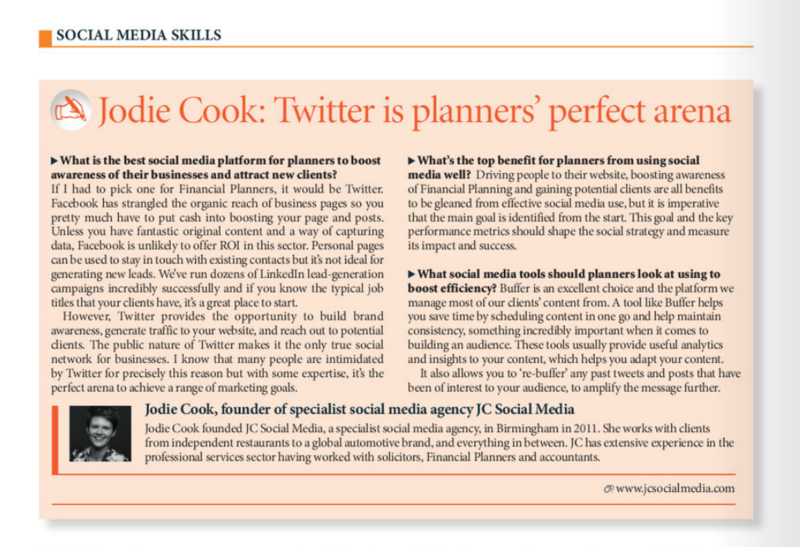 This month our founder Jodie Cook discusses social media for financial planners with Financial Planning Today magazine and you can read the interview plus Jodie’s dos and don’ts for financial planners below. We thought we’d add our expertise on the subject, here, too. Advertising in the professional services sector can be tricky. Social media marketing adds a whole new element of complexity and some unchartered territory in terms of governance. Seeking guidance from an expert or experienced team of professionals is strongly advised. Social media platforms are used in virtually every sector and the financial services sector is no different. Whilst many of the general principles of social media marketing hold true, with professional services, there are other considerations. Whilst knowing what to post and when to post is the predicament facing most businesses on social media, for financial services, there are other legislative bodies governing what is actually allowed to be said. This is all very important to be aware of, especially if you or your firm are branching out into social media marketing. The techniques used by the financial sector to generate sales and leads are similar to those of any business. Depending exactly on the types of finance business you are and who your typical client is, Facebook, LinkedIn, and Twitter are all likely to be important. If you tend to deal with people with a certain job title within a business, for example, searching these terms on LinkedIn and Twitter will help you identify them. Similarly, if you specialise in certain industries or work with individuals with certain interests, again, both platforms will be useful. From a brand reputation and awareness point of view, LinkedIn, Facebook and Twitter will all provide useful channels through which to distribute content tailored to each platform. Utilising Facebook promoted posts and Twitter advertising, creating awareness of your brand, its services, and its ethos will occur quickly. Staying abreast of news and developments in the financial sector and sharing this with your audience will help show your expertise and interest int he field. Ensuring that your content is value-adding is crucial in building a loyal and engaged audience. You can also compound this by creating your own content through high-quality blogging. The FCA (Financial Conduct Authority, formerly known as FSA) published guidance on social media use by companies as far back as 2010. The FSA were classed as media neutral, meaning that the way you used social media was viewed in the same way you would use a newspaper advertisement. Since then, The FCA has published new guidance on how financial companies should use social media, especially in regards to financial promotions. If you’re in the financial services sector, we strongly advise you read this document if you’re active on social media. The FCA has ‘the ability to ban financial products, publish details of misleading financial promotions, and let people know when [they] are taking disciplinary action against a firm.’ This means that your social media marketing must be meticulous in ensuring that descriptions are clear and accurate while compliance teams should ensure that they have vigorous approval procedures in place. There are examples in the guide that provide a good idea of what is and isn’t acceptable. If you’re familiar with the financial promotions regulations then the guidance will come as no surprise; “be clear and do not mislead consumers” are the main points as well as making consumers aware of potential risks to their capital. LinkedIn is a fantastic lead-generation platform for all businesses and financial services are no different. Regardless of your specific target audience, there are valuable techniques to be used on LinkedIn to find them. If your business typically provides financial services to micro businesses, for example, you’ll tend to deal with the managing director. Finding the MD of micro business on LinkedIn is easy. In fact, if you know the typical job role of the people who are most useful to you as leads, LinkedIn in the place to get them. Not sure where to start on LinkedIn? Check out our training. There’s no reason why financial services businesses should not be thriving on social media. The tools are out there to grow a significant network and develop your brand. A number of professional services businesses are wary of social media marketing but this is simply down to a lack of understanding of how useful it can be and how easy it is to make sure everything you post is within the rules. At the end of the day, the FCA’s main aim is to protect consumers, so, as long as everything you do is in your clients’ best interest you should have no cause for concern. Make guidelines for employees. This is both from a marketing point of view and from a security and legislative point of view. Get some expert social media training, if necessary. Make sure you have a company LinkedIn page, Facebook page and Twitter account and make sure they’re optimised in terms of branding and company information. Social media for professional service providers is all about building trust and credibility. Sharing valuable information as well as demonstrating a human side to the business can help grow their social sphere of influence, helping to both raise brand awareness and generate leads. Financial planners, paraplanners, wealth managers and advisers should be using social media regularly to keep in touch with people they meet, staying in their minds and becoming the go-to person for their services in the future. What is the best social media platform to boost awareness of their businesses and potentially attract new clients? If I had to pick one for financial planners, it would be Twitter. Facebook has strangled the organic reach of business pages so you pretty much have to put cash into boosting your page and posts. Unless you have fantastic original content and a way of capturing data, Facebook is unlikely to offer ROI in this sector. Personal pages can be used to stay in touch with existing contacts but it’s not ideal for generating new leads. We’ve run dozens of LinkedIn lead-generation campaigns incredibly successfully and if you know the typical job titles that your clients have, it’s a great place to start. However, Twitter provides the opportunity to build brand awareness, generate traffic to your website, and reach out to potential clients. The public nature of Twitter makes it the only true social network for businesses. I know that many people are intimidated by Twitter for precisely this reason but with some expertise, it’s the perfect arena to achieve a range of marketing goals. Aside from the obvious sites such as Twitter, Facebook and LinkedIn what other forms of social media should Financial Planners, paraplanners, wealth managers and advisers consider using? For e.g. Snapchat? To those in the financial planning sector, social media holds the greatest value as a tool to connect with people they meet, build a digital rapport with them, and ensure that they are an authority within that growing network. This doesn’t require any fancy content marketing, just a genuine interest in helping other people and these people tend to hang out on Facebook, Twitter and LinkedIn. What is the biggest benefit to financial planners, paraplanners, wealth managers and advisers from using social media well? Is it driving people to their websites? Boost awareness of financial planning in general? Gaining potential clients? Driving people to their website, boosting awareness of financial planning and gaining potential clients are all benefits to be gleaned from effective social media use, but it is imperative that the main goal is identified from the start. This goal and the key performance metrics should shape the social strategy and measure its impact and success. For example, becoming an authority on the subject is incredibly important but it should have some metrics associated with it. If leads are the goal, activity on LinkedIn must be geared up to reaching prospects and engaging them with InMail messages. What are your top 3 dos and don’ts of social media for financial planners, paraplanners, wealth managers and advisers? Show some personality. Look to strike a balance between professionalism and being personable and approachable. Share information that is relevant and engaging to your audience. Demonstrating that you understand what resonates with individuals is the fastest way to build their trust. Adapt to your audience. Shift your focus based on what works and what doesn’t. Social media requires both proactivity and reactivity when it comes to optimising your approach. Don’t leave all your social media until a quiet Friday afternoon. No one is online and no one is going to take the action you need to generate leads. Don’t try and cover all your bases and post on six or seven social networks. Focus your efforts on two or three channels, the ones you’re seeing the most benefit from. Don’t be too salesy in your language. Platforms like Facebook and Twitter are usually regarded as someone’s personal space and few welcome pushy messages, especially if they’re not well targeted. Always attempt to add value to your audience somehow. What social media tools should financial planners, paraplanners, wealth managers and advisers look at using to boost efficiency? I.e Hootsuite, Tweetdeck, Buffer etc. Buffer is an excellent choice and the platform we manage most of our clients’ content from. A tool like Buffer helps you save time by scheduling content in one go and help maintain consistency, something incredibly important when it comes to building an audience. These tools usually provide useful analytics and insights to your content, which helps you adapt your content. It also allows you to ‘re-buffer’ any past tweets and posts that have been of interest to your audience, to amplify the message further. For any doubters/skeptics who think social media is a waste of their time and effort, what would be your key messages to convince them otherwise if you had just a minute or two to win them over? Yes, tweeting about what you’re eating for dinner is not going to win you new clients, but social media is so much more complex. We can target people based on all kinds of information and reach out on an individual basis. Whether you’re a B2B or B2C business, virtually every business is P2P; person to person. No matter how corporate your business may be, you are still building relationships with people, through people. If you’re one to say “we get all our business through referral and word-of-mouth”, social media is the 21st century’s equivalent.